Nancy Beck and Steve Dodge of Martinsville and Jeanne McLeish of Mooresville are amongst a group of more than 100 artists who have been featured in this year’s Hoosier Salon 89th Annual Exhibition. The salon is the state’s oldest art competition. Of the 498 pieces that were submitted, only 138 were chosen to be featured in the exhibit. To submit a work for judging, one must be a current Indiana resident or have lived in Indiana for at least one year. The artist must also be a member of the Hoosier Salon. After the close of the exhibit, a select number of works will tour around the state at various museums. The Hoosier Salon Art Gallery has been around since 1925, showcasing local art and providing the public with the opportunity to enjoy it. Beck’s oil painting, Sunlit Bouquet, she says, was pure luck. Beck had gone out to pick wildflowers at a small cabin on Lake Michigan, which she and her husband rent every year. She brought them inside, put them in a vase and set them on the table. She noticed the light coming in through the screen door was just perfect. So, she set out to capture the image with her artistic tools. Beck has been accepted to The Hoosier Salon three times: in 2004, 2010 and 2013. She received a purchase award in 2004. 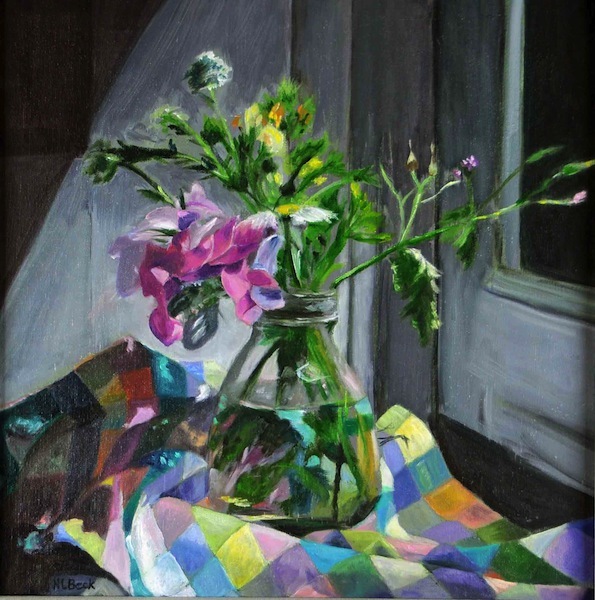 Most of her paintings feature portraits, plein air scenes and still life. She is currently working on a series of large portraits called “Signs,” which she put on hold just long enough to complete an image of a lion named Thor to be auctioned off in the Boomer Bash in Bloomington. Her paintings are for sale though her website http://www.nancybeckfineart.com/ or through her studio, The Stutz, in Indianapolis and L.B.B. Interior Design and Gallery in Key West, Fla. The painting can be seen at the Eugene and Marilyn Glick Indiana History Center, 450 W. Ohio St., Indianapolis. The exhibit will run through Sept. 28. It is open to the public during regular museum hours, 10 a.m. to 5 p.m., Tuesday through Saturday. The cost of admission is $7 for adults, $6.50 for seniors and $5 for youth ages 5 to 17. For some artists, finding a creative niche means reaching back into their past to discover what’s always been waiting there for them. Such is true for Nancy Beck, this month’s featured artist in the stairwell gallery at the Morgan County Public Library. The exhibit features a variety of works including portraits, still-life paintings and a few faces and places from the Martinsville area. As she began thinking about a way to spend her free time, Beck found herself interested in an area that she’d been immersed in since she was a young child — art. Although Beck says she is self-taught, many of her talents mirror those of her mother. Beck uses a digital camera to capture the images she will someday paint, but her mother had a different tactic. Barbara Beck began painting in the early 1970s and studied under Indiana artist Rosemary Brown Beck, her sister-in-law. Beck’s medium is oil on canvas. In 1982, Beck opened a framing business and art gallery in Carmel, where she remained until she retired in 1997. Today, she stays active in art, making quilts. The mother-daughter duo has seen a fair share of awards honoring their work. “Mom entered her paintings in the Hoosier Salon and won every year, from 1974 to 1982,” Nancy Beck said. Nancy Beck has also had her work chosen for the Hoosier Salon twice — once in 2004 and again in 2010. Beck’s work focuses on portrait work and images of Indiana and Key West, Fla. where she and her husband, John White, own a cottage. In addition to her images of familiar fields and distant coastline, Nancy Beck also creates commissioned works. Among her favorites is an image of two dogs that Beck painted for their owner. “They are really dog-lovers and both dogs passed away shortly after the print was finished. I was really glad that she was able to have that piece to remember them,” Beck said. Beck said she’s learned a lot about photography, art and design as she has worked to perfect her talents. “Draw what you see and not what you know is there. It’s about tricking your mind to think with your sight,” Beck said. “If you have a passion for it, stay with it. Get into it. Beck said she always challenges herself to stay creative and try new things. Sometimes, those stories bring her back home to Martinsville. “I have two portraits that I painted from photos that I took during a parade in Martinsville — one is a little girl with a butterfly painted on her face and the other is a soldier with a flag. I don’t know who they are, but would love to find out,” Beck said. Beck invites the community to visit her display at the library, view the two images and call her at the studio with more information about the solider and girl featured in her work. Beck’s artwork is also on display in her studio or online atwww.nancybeckfineart.com. The stairwell gallery is at the main branch of the Morgan County Public, 110 S. Jefferson St., Martinsville. The gallery is open during regular library hours, which are 9 a.m. to 8:30 p.m. Monday through Thursday; 9 a.m. to 5:30 p.m. Friday and Saturday; and from 1 to 5 p.m. on Sunday. For more information call the library at 765-342-3451.